The "birther bigots" -- the movement that stubbornly clings to the repeatedly-proven-false belief that President Obama is not a native-born U.S. citizen and is illegally holding the presidency -- is nothing if not determined in its racially-and-religiously-motivated hate campaign to drive the nation's first African-American president out of office. 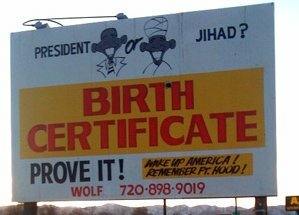 That the "birthers" are motivated by sheer bigotry was made even more evident last week when the owner of an automotive dealership in a Denver suburb erected a billboard displaying a caricature of the president wearing a turban and bearing the words "President or Jihad?" And now former Alaska Governor Sarah Palin, the 2008 Republican vice presidential nominee, has effectively joined the ranks of the "birther bigots" by publicly declaring that she "doesn't have a problem" with those who, despite overwhelming evidence to the contrary, still stubbornly insist that the president is not a native-born American, but a native of his father's homeland of Kenya -- a belief that the Kenyan government dismissed as "madness" and "a red herring" and even many mainstream conservatives brand "loony." During a radio interview with conservative radio host Rusty Humphries as part of her national tour to promote her book, Going Rogue: An American Life, Palin, asked if -- should she decide to run for the White House in 2012 -- she would make Obama's birthplace an issue, said, "I think the public rightfully is still making it an issue. I don't have a problem with that." Palin added, "I don't know if I would have to bother to make it an issue, because I think that members of the electorate still want answers." Asked by Humphries if the question of whether the president is a native-born U.S. citizen, as the Constitution requires, is a "fair question," Palin replied, "I think it's a fair question, just like I think past associations and past voting records. All of that is fair game." Palin sought unsuccessfully to make Obama's longtime friendship with his former pastor, the now-retired Reverend Jeremiah Wright, an issue in the 2008 campaign. She was repeatedly overruled by John McCain, the Republican presidential nominee, on the grounds that to bring up Wright would leave the McCain-Palin campaign vulnerable to accusations of race-baiting. Palin told Humphries that McCain's refusal to bring up Reverend Wright showed that "the McCain-Palin campaign didn't do a good enough job in that area. We didn't call out Obama and some of his associates on their records and what their beliefs were, and perhaps what their future plans were, and I don't think that was fair to voters to not have done our job as candidates and a campaign to bring to light a lot of things that now we're seeing manifest in the administration." But McCain, to his credit, was determined not to be seen as a bigot -- especially after he was forced to confront the birthers' open hatred of Obama head-on during a town hall-style campaign stop in Minnesota less than a month before the election. At virtually the same time Palin made her comments, the owner of an automotive dealership in a Denver suburb triggered a furor by erecting a billboard that compares the president to a terrorist and demands that the president prove that he is a native-born U.S. citizen by producing his Hawaii birth certificate -- in spite of the fact that Obama had done so well over a year ago and that it had been certified by the State of Hawaii. Phillip Wolf, owner of Wolf Automotive in Wheat Ridge, Colorado, accused the president of lying about where he was born. "This man is not telling the truth," Wolf said. "He should prove he's an American." Wolf also insisted that Obama is a Muslim -- despite all evidence to the contrary that he is a Christian, including the president's 20-year membership in the Trinity United Church of Christ in his adopted hometown of Chicago, now headed by the Reverend Otis Moss III. "Everything I have read about Obama points right to the fact that he is a Muslim," Wolf told Denver's KDVR-TV, "And that is the agenda of what Muslim is all about. It's about anti-American, it's about anti-Christianity." Wolf said he was prompted to put up his billboard by the November 5 massacre at the U.S. Army base at Fort Hood, Texas, in which Army Major Nidal Malik Hasan, a Muslim suspected of having ties to radical jihadists, went on a shooting rampage on the sprawling base, killing 13 people and injuring over a dozen others before he was himself shot and wounded by a civilian police officer. Hasan, who's now at a military hospital in San Antonio, faces 13 counts of murder. Wolf insisted that he's not a racist, claiming that his wife is a Latina and that he cast a write-in vote in last year's presidential election for Alan Keyes, a right-wing African-American commentator who ran unsuccessfully against Obama in the 2004 U.S. Senate contest in Illinois. To which we at The 'Skeeter Bites Report respond with two words: Prove it. If Wolf isn't a bigot, as he claims he's not, then why has he -- as well as Palin -- chosen to join forces with a movement that has been documented again and again over the past year to be motivated by a combination of misplaced Islamophobic bigotry and thinly-disguised racism against this president? Why have Wolf and Palin chosen to align themselves with a movement that includes many self-avowed white supremacists? The 'Skeeter Bites Report has documented the fact that the belief that Obama is a foreigner has become fodder in white-supremacist circles, including Stormfront, the largest and best-known "white-nationalist" site on the Web; and the Council of Conservative Citizens, listed by the Southern Poverty Law Center as "the largest white-nationalist group in America" -- essentially a reincarnation of the old White Citizens Councils that were formed in the South to resist racial desegregation in the 1950s and 1960s. The right-wing Web site WorldNetDaily has been -- and continues to be -- particularly bullheaded in its stubborn insistence that Obama is not a native-born American, despite one claim after another being debunked, even hawking a video that challenges Obama's citizenship. WND was founded in 1997 by Joseph Farah, a firebrand social conservative who was editor-in-chief of the now-defunct right-wing California newspaper The Sacramento Union. Farah is a fierce proponent of the "birther" conspiracy theory -- and he vows never to let up. "It'll plague Obama throughout his presidency," Farah insists. "It'll be a nagging issue and a sore on his administration, much like Monica Lewinsky was on Bill Clinton's presidency. It's not going to go away, and it will drive a wedge in an already divided public." WND's senior editor is Jerome Corsi, author of the highly controversial and largely discredited book, The Obama Nation, which The 'Skeeter Bites Report flatly consider libelous -- and who has connections with known white supremacists. Corsi, who dwelled extensively in his book on the two interracial marriages of the president's white, Kansas-born mother, Stanley Ann Dunham -- first to his black father from Kenya, Barack Obama, Sr. and later to his Asian stepfather from Indonesia, Lolo Seotoro -- went so far as to promote his book on several white-supremacist Internet media outlets, including Stormfront's "Political Cesspool" online radio show,according to the Southern Poverty Law Center, which monitors right-wing extremist groups. Then there is Palin -- who did nothing to stop an eruption of blatantly racist passions against Obama at her solo campaign appearances during the final weeks before last year's election -- passions that were captured in a shocking report by a correspondent for the English-language channel of al-Jazeera and openly stoked by Palin herself. That prompted The 'Skeeter Bites Report to declare in a strongly-worded editorial on October 20, 2008 -- which included a video of the al-Jazeera report -- that Palin was unfit to serve as the nation's vice president. In the wake of her latest comments to Humphries, it's clear to us that the former Alaska governor is even more unfit to serve as president and that for her own sake, she would be wise not to seek the GOP presidential nomination in 2012 -- or make any other run for the White House at any time in the future beyond that. Wolf's billboard was condemned by the Mountain States chapter of the Anti-Defamation League for exploiting the Fort Hood massacre "in a context replete with bigotry." In a statement issued by Bruce DeBoskey, the ADL's Mountain States director, the anti-hate watchdog branded Wolf's billboard "divisive and offensive" and that it "perpetuates hateful and harmful stereotypes about Muslims." The ADL's national office noted back in August that since Obama's election, anger among white supremacists and other right-wing extremists "resulted in an avalanche of vitriolic postings on racist Web sites." Meanwhile, a liberal radio talk-show host, David Sirota, said that Wolf's billboard was an example of right-wing hatred of the president flying "out of control." "This brings together all those strands of [hate]: the racism, the anti-Muslim fervor," Sirota told KDVR-TV. "It's one thing to criticize the president on health care, or Wall Street reform, or immigration. But this is outrageous. And I think it's a fair question to ask why these questions about religion and ancestry are being directed so viciously at the first African-American president of the United States." A liberal group, Progress Now Colorado, has called for a boycott of Wolf's dealearship. Bobby Clark, a PNC spokesman, told The Denver Post that "birthers" and "teabaggers" like Wolf have been "emboldened" by right-wing politicians and media pundits. "When people like Rush Limbaugh . . . Glenn Beck and elected officials like Sarah Palin . . . openly question the president's citizenship and compare him to terrorists, it gives permission to this kind of speech," Clark said. "It's hateful. It's racist. It's outrageous." Wolf also owns auto delearships in Wyoming and Montana, but it was not clear if they would also be targeted for boycotts. Then there is Orly Taitz, by far the most notorious of the "birther bigots." The seemingly inexhaustibly litigious Taitz has seen one lawsuit after another seeking to prove the Obama was born in Kenya thrown out of court as frivolous after one alleged "Kenyan" birth certificate after another filed by Taitz as "evidence" was quickly exposed as forgeries. Who can forget her highly combative appearance on MSNBC last August? In that interview, Taitz was confronted by anchor David Shuster's pointing out that announcements of Obama's birth at a Honolulu hospital on August 4, 1961 were published a week later by both of the city's two major newspapers, the Advertiser and the Star-Bulletin. The Star-Bulletin even noted in an editorial published last July that the birth announcements published in the two newspapers are available for viewing on microfilm at the main branch of the Hawaii State Library in Honolulu. The 'Skeeter Bites Report subsequently revealed in a September 7 expose that Taitz -- an immigrant from the former Soviet republic of Moldova who holds dual U.S. and Israeli citizenship -- is a rabidly anti-Muslim bigot who considers the president a "dangerous threat" to the security of Israel. We also revealed that Taitz had support from the Jewish Task Force, a radical extremist group whose members, according to its Web site, follow the teachings of the late Rabbi Meir Kahane, founder of the militant Jewish Defense League (JDL), who later emigrated to Israel and founded the far-right extremist Kach Party -- which was subsequently outlawed as a racist organization by the Israeli government. The JTF, like Taitz, adamantly insists that President Obama is a Muslim and considers him a traitor to the U.S. and a direct threat to Israel. "We are opposed to Israel surrendering land for 'peace,'" the JTF declared on its Web site. "We are also opposed to Islamic terrorism, which we believe is an integral part of Islam." A JTF subsidiary, Jews Against Obama, posted a highly inflammatory video on its Web site that claims Obama "wants to destroy Israel." So it should come as no surprise that the "birther" movement would be riddled with with white supremacists, anti-Muslim bigots and other extremists, persisting in their hate campaign against Obama no matter how thoroughly their "evidence" against the president is debunked again and again and again. To use Wolf's own words against him, the time has come to "call a spade a spade" -- as he did against the president -- and call out the "birthers" as the bigots that they really are. By now, it should be clear to everyone that bigotry is the only reason why the "birthers" continue in their drive to kick the nation's first black president out of office -- no matter how vehemently they deny it. The 'Skeeter Bites Report has no doubt that this hate campaign would not exist if Obama was a white man -- and we defy the "birthers" to try to prove otherwise. To paraphrase Clint Eastwood: Go ahead, "birther" punks -- make our day.